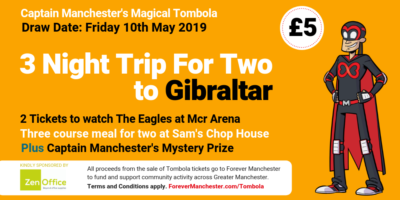 We send the October winner of our Tombola off to Hamburg and we have information of more amazing prizes in the November draw..
An update and information on how you can still get involved with October Cheer Fest! Promotion of two great socials in Spooktacular and Forever Funny in aid of Forever Manchester. Plus we have news of all the latest funding opportunities for community groups across Greater Manchester! The Forever Manchester Update is presented by Terry Snowden MBE and Josh Dyson.